On this minisode, we ended up with a non blind review of Lagunitas Cappuccino Stout. Which was chosen because it was one of the recommended picks from the staff of the Total Wine & More in Rancho Cucamonga. 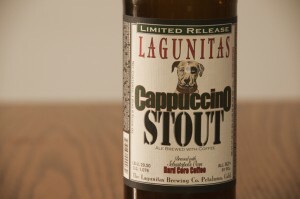 Posted in Blind Taste Testing (2011 - 2013) and tagged Beer is Art, Cappuccino Stout, Lagunitas, Lagunitas Cappuccino Stout, Total Wine & More.